1. Andrei Kolesnikov article headlined "Rosneft Served for Dinner" gives an ironic account of President Vladimir Putin's meeting with experts of the Valdai club; pp 1, 3 (1,815 words). 2. Ksenia Dementyeva and Yevgeny Khvostik article headlined "Seeking Hot Ruble" says the Renaissance group has opened its bank in Nigeria, the Renaissance Credit Nigeria bank. Experts warn that business in Nigeria is fraught with high risks due to an unstable political situation and a high crime rate; pp 1, 10 (877 words). 3. Pyotr Netreba article headlined "Sale With Shortfall" says that because of a ban on state companies taking part in privatization in 2013, the estimated revenues will make up only 260-270 billion rubles; pp 1, 6 (814 words). 4. Oleg Rubnikovich article headlined "Law-Enforcers Attack Defense Ministry" says the Investigative Committee conducted dozens of searches Thursday in connection with a probe into the sale of several properties owned by the Defense Ministry; pp 1, 5 (908 words). 5. Maxim Ivanov article headlined "Cost of Vote Soars" says the financing of parties that gained over 3 percent of votes in elections may grow twofold and reach 1.6 billion rubles in 2013. Experts refer to the novelty as a direct bribery of the leadership of the parliamentary parties; p 2 (680 words). 6. Anna Pushkarskaya article headlined "Kremlin's Representative Voices Dissenting Opinion" says the presidential representative at the Constitutional Court, Mikhail Krotov, has for the first time in the court's history motioned to recuse judge Gennady Zhilin because of a dissenting opinion the judge expressed earlier on a different case. Experts consider the move to be a threat to those having dissenting opinions ahead of the upcoming hearings of a huge number of suits filed by opposition; p 2 (948 words). 7. Ilya Barabanov et al. report headlined "Certificate of Capital Nature" looks at how the situation in Moscow has changed since Moscow Mayor Yury Luzhkov was dismissed; p 4 (2,480 words). 8. Maxim Ivanov article headlined "There Is No Truth Left After Storm" looks at polls that show that 10 years after terrorists captured the Dubrovka Theater in Moscow, Russians doubt the authorities are telling the truth about the terrorist attack. At the same time, the majority of Russians believe that in case of a terrorist attack, the authorities will negotiate with terrorists and will try to avoid bloodshed at any cost; p 5 (520 words). 9. Grigory Tumanov and Ilya Shepelin article headlined "Sergei Udaltsov Has Fewer Grounds for Arrest Now" speculates whether Left Front leader Sergei Udaltsov will come to the Investigative Committee today to hear charges against him or flee. Meanwhile, activist Leonid Razvozzhayev has stated that he was kidnapped and forced to implicate Udaltsov by saying they had been preparing a coup; p 5 (615 words). 10. Maxim Yusin article headlined "Israel Rehearses Strike on Iran" says that Sudan has accused Israel of bombing one of its military plants. Experts offer a guess that the plant might have been a polygon Israel used to practice a possible strike at Iranian nuclear facilities; p 7 (415 words). 11. Georgy Dvali article headlined "Georgian Parliament Approved Dream's Position" says the Georgian parliament has approved the composition of the new government with the leader of the Georgian Dream coalition at the helm; p 7 (561 words). 12. Olga Mordyushenko article headlined "License Renewed for Shtokman" says that Gazprom wants to change the conditions for developing the Shtokman hydrocarbons deposit; p 11 (574 words). 1. Oleg Vladykin article headlined "Defense Ministry Overdoes With Service" says the Investigative Committee has conducted searches in the central office of the company Oboronservis, which is affiliated with the Defense Ministry. The investigative actions were conducted in line with a criminal case into fraud with state property with estimated losses of over 3 billion rubles; pp 1-2 (668 words). 2. Yury Simonyan article headlined "Government of Georgian Dream" says the Georgian parliament has approved the composition of the government with the leader of the Georgian Dream coalition Bidzina Ivanishvili as prime minister; pp 1,7 (921 words). 3. Alexei Gorbachev article headlined "Awaiting Arrests" says that Udaltsov's lawyer is sure he will be arrested today at the Investigative Committee after charges against him are brought. Meanwhile, the non-parliamentary opposition has handed over to the Council of Europe materials proving that Leonid Razvozzhayev, who confessed to preparations for riots across the country along with Udaltsov, was tortured; pp 1, 3 (741 words). 4. Sergei Kulikov article headlined "Labor Migrants to Fly Planes" says the Transportation Ministry has demanded that the ban on employing foreign pilots be lifted as Russian airlines lack some 2,100 qualified pilots, affecting flight safety; pp 1, 4 (916 words). 5. Darya Tsiryulik article headlined "Voting Right Infringed On in Wild West" says Texas authorities have refused to allow the OSCE to monitor the presidential election; pp 1, 8 (947 words). 6. Alexandra Samarina article headlined "Creative Emigration" says the number of representatives of the creative class willing to leave the country has been growing and looks at the reasons behind the trend; pp 1, 3 (742 words). 7. Editorial headlined "Charges as Fact of Guilt" says the case of Leonid Razvozzhayev, who, according to law enforcement officials, gave himself up and pleaded guilty, and in the opposition's opinion was kidnapped in Ukraine and tortured, highlights the need for a verification procedure that would ascertain the truth in such situations; p 2 (477 words). 8. Anton Khodasevich article headlined "Lukashenko Pulls Pity Card" looks at the talks between Moscow and Minsk on oil supplies to Belarus; p 2 (536 words). 9. Ivan Rodin article headlined "There Is Money but No Party" says that Prime Minister Dmitry Medvedev has announced that the financing of four parliamentary parties and the Yabloko party will be increased twofold. Meanwhile, no political parties have been registered during the last month and a total of 12 parties have been denied registration since the period of active party construction began; p 3 (724 words). 10. Konstantin Bondarenko article headlined "All Quiet on the Ukrainian Pre-Election Front" looks at the situation in Ukraine ahead of the parliamentary election set for Sunday; p 3 (768 words). 11. Igor Naumov article headlined "State Companies Banned From Buying State Property" says the government on Thursday discussed the implementation of the privatization plan for 2011-13 and reiterated that it will ban state companies from taking part in the process; p 4 (857 words). 12. Oleg Nikiforov article headlined "South Korea May Become Russia's Key Energy Partner" says participants in an international conference on Russian-Korean cooperation have emphasized that South Korea is interested in supplies of Russian gas via the territory of North Korea. The project may also help reach a compromise on the cost of Russian gas for the Chinese market; p 4 (862 words). 13. Andrei Serenko article headlined "Kidnapping for Export" says that four officers of the Astrakhan region department of the Federal Security Service are suspected of kidnapping. Experts warn that law enforcement officials in the Southern Federal District may be engaged in clan feuds in the North Caucasus; p 6 (890 words). 14. Tatyana Ivzhenko article headlined "Yanukovych Makes Hint for Brussels" says that Russian-Ukrainian gas agreements are unlikely to be revised in November despite the Ukrainian president's optimistic forecasts, as Moscow has refused to reduce the gas price unless Ukraine joins the Customs Union; p 7 (810 words). 15. Grigory Mikhailov article headlined "Kyrgyz People Asked to Drink Less" says the Kyrgyz prime minister, exasperated by the budget deficit, has called on people to stop drinking vodka and start working; p 7 (622 words). 1. Maxim Tovkailo et al. report headlined "Sale on Schedule" says the government has approved the schedule for privatization of major assets for 2013; pp 1, 8 (800 words). 2. Natalya Voronova et al. report headlined "Igor Kim Close to Absolute" says that as Nomos-Bank has given up the idea of buying Absolut bank, Igor Kim's Ekspo-Bank becomes the only real bidder for the asset; pp 1, 9 (512 words). 4. 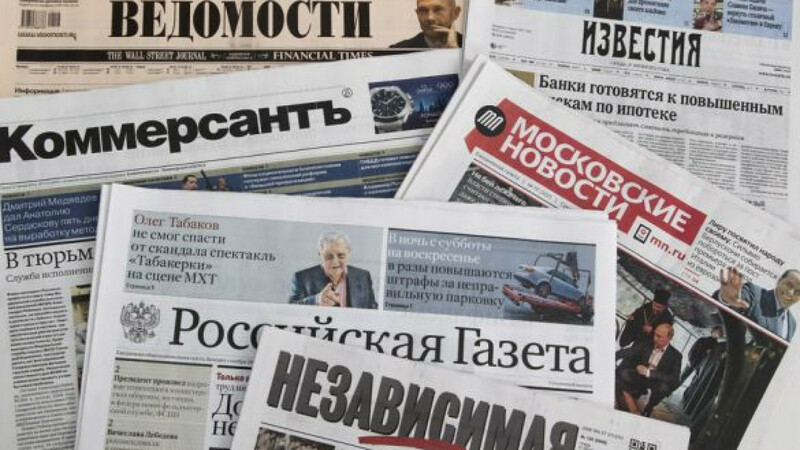 Editorial headlined "Housing Issue" ponders why the news about the upcoming increase in property taxes in Moscow has caused such an uproar; pp 1, 4 (593 words). 5. Editorial headlined "Naryshkin's Filter" says the United Russia faction has set up an expert council to assess bills drafted by deputies to ensure they are properly prepared and doubts that the new filter will be efficient; p 4 (220 words). 6. Natalya Kostenko and Irina Novikova article headlined "'We Are Even Getting Ahead of U.S.'" says that at the meeting with experts of the Valdai club, President Vladimir Putin criticized the policy of European countries and said that Russia can help to overcome the crisis; p 2 (361 words). 7. Polina Khimshiashvili and Alexei Nikolsky article headlined "Special Services Can" says the Ukrainian authorities on Thursday admitted that Russian special services had taken Russian opposition activist Leonid Razvozzhayev out of Kiev; p 2 (379 words). 1. Tatyana Shchadrina article headlined "Labor Migrant at Wheel" says the Transportation Ministry will soon offer for public discussion a bill to allow foreign pilots to work for Russian airlines; pp 1, 4 (550 words). 2. Natalya Kozlova article headlined "Serviced" looks at a probe into the activities of the company Oboronservis, which is affiliated with the Defense Ministry. Features comments by Defense Minister Anatoly Serdyukov and chief military prosecutor Alexei Fridinsky; pp 1, 7 (1,000 words). 3. Kira Latukhina article headlined "No One Is Guilty" says President Vladimir Putin's meeting with Valdai club experts yielded no sensations; p 2 (950 words). 4. Viktor Feshchenko article headlined "Military Silence" says the Syrian army is ready to cease fire during the Eid al-Adha holiday and wonders what the reaction of the opposition forces will be; p 8 (550 words). 1. Alexander Potapov article headlined "President Assigns Surkov to Handle Domodedovo" says President Vladimir Putin has chosen Deputy Prime Minister Vladislav Surkov to deal with the reconstruction of Domodedovo airport and chose the reconstruction model proposed by the Transportation Ministry; pp 1,4 (530 words). 2. Mikhail Popov et al. article headlined "Serdyukov's Cottage Sold to Money Laundering Company" says that Defense Minister Anatoly Serdyukov is at the center of a scandal as a result of a probe the Investigative Committee is conducting into fraud with the ministry's property; pp 1, 4 (950 words). 3. Yekaterina Nuriakhmetova article headlined "Sochi Olympics to Be Protected by Military Robots" says that next year the Federal Security Service will obtain new robots Plastun designed to patrol and quickly identify suspicious objects and people; p 2 (457 words). 4. Yanina Sokolovskaya interview with Ukrainian Deputy Prime Minister and Party of the Regions co-leader Sergei Tigibko headlined "Ukraine's Joining Customs Union Is Political Issue" where he speaks about Sunday's parliamentary elections in Ukraine and how the makeup of the new parliament may affect relations with Russia; p 5 (911 words). 1. Olga Bozhyeva article headlined "Defense Ministry From Investigators" wonders whether searches at Defense Ministry offices were meant to serve as a blow to the defense minister's reputation; pp 1-2 (420 words). 2. Mikhail Rostovsky article headlined "Who Cheated in Razvozzhayev's Case" comments on the story of Russian opposition activist Leonid Razvozzhayev; pp 1-2 (500 words). 1. Ivan Petrov report "To Putin for Protection" looks at the investigation currently being carried out in connection with Defense Ministry company Oboronservis amid allegations that its officials have been involved in fraud. Having found himself at the center of the scandal, Defense Minister Anatoly Serdyukov did not attend a government meeting, but went to Putin at his suburban residence in Novo-Ogaryovo instead; pp 1-2 (600 words). 2. Inga Vorobyeva report "President and Valdai Members Waste 2 Hours of Their Lives" looks at the Valdai international discussion club and says the format of the meeting has proved boring and the participants in the meeting did not like Putin's posture of lecturer; p 2 (550 words). 3. Alexander Litoi report "Change in Protest" says the film "Anatomy of a Protest 2" shown on Gazprom-owned NTV television has made Europe use the so-called African approach to Russia in terms of financing civil projects; p 2 (700 words). 4. Article by Metropolitan Ilarion of Volokolamsk, the head of the foreign ties department at the Russian Orthodox Church, who speaks about the construction of mosques in Moscow; p 5 (400 words). 5. Galina Starinskaya report "Putin Solves Conflict at TNK-BP" says that Putin has explained why he agreed to Rosneft buying BP's share in TNK-BP; p 6 (700 words). 6. Vitaly Petlevoi report "LTE Comes and Goes" says the company Summa Telekom has lost a lawsuit regarding a right to LTE frequencies; p 9 (300 words). 1. Pavel Felgengauer report "Investigative Committee Against Serdyukov" says the Investigative Committee has accused Defense Ministry holding company Oboronservis of fraud and embezzlement; p 2 (600 words). 2. Olga Musafirova report "'They Tortured Me for Two Days" says that Left Front activist Leonid Razvozzhayev has told human rights activists how he was captured and tortured; p 3 (900 words). 3. Sergei Kanev report "Kolokoltsev's 5 Steps" looks at the reform of the Interior Ministry and the internal war among security forces clans; pp 4-5 (2,300 words). 4. Andrei Kolesnikov report "Perfectly Learnt Helplessness" looks at a report issued by the Center for Strategic Research saying that Russians are disappointed with the authorities but do not believe in their own abilities either; p 7 (800 words). 5. Irina Petrovskaya report "TV Sacrifice" says that Russian TV regards itself as investigators, prosecutors and judges all at once; p 24 (900 words). 1. Nadezhda Bulanova report "Ruling Party Decides to Re-Write Constitution" says it has been announced that a working group has been set up to collect proposals to amend the Constitution; p 2 (250 words). 2. Sergei Putilov report "Minister Serdyukov Within Sight of Investigators" says the office of Defense Ministry holding company Oboronservis has been searched; p 2 (400 words). 1. Kirill Shlykov et al. report looks at the details of a special operation to eliminate terrorists in Kazan, Tatarstan; pp 1, 5 (800 words). 2. Andrei Yegorov report "'Filter Against Fools' Appears in State Duma" says the United Russia faction has set up barriers to prevent populist bills from being officially submitted to parliament; p 3 (250 words). 3. Tatyana Gushcina interview headlined "I Am Against Religion's Interference With School" with Alexander Khloponin, a deputy prime minister and presidential plenipotentiary in the North Caucasus Federal District; p 4 (500 words). 1. Alexandra Beluza report "If You Have Betrayed" looks at amendments to the Criminal Code regarding high treason; p 2 (800 words). 2. Tsvetelina Miteva report "At Whose Cost Is It Banned" looks at the new law aimed at protecting children from harmful information; p 3 (1,000 words). 1. Anton Stepanov report "Defense Ministry Werewolves" looks at the fraud and embezzlement scandal involving the Defense Ministry; p 2 (400 words). 2. Yegor Sozayev-Guryev report "Defense Minister May Resign Soon" says that according to a military analyst, Defense Minister Anatoly Serdyukov may be dismissed amid the fraud scandal; p 2 (250 words).